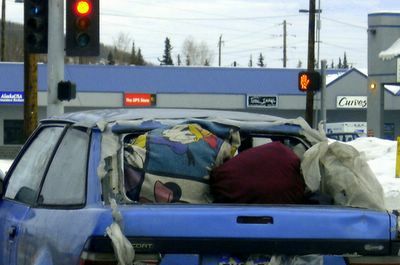 Another Fairbanks resident showing ingenuity in dealing with conditions. Apparently, they got tired of that cold window and put in nice, warm, soft fluffy pillows. I wonder if they smell like fabric softener? You can click on the picture for larger pillowy goodness. The Governor of Alaska has recently decided that he needs to set up a media/ad campaign to convince the United States that we’re not a bunch of shameless, greedy beggars up here. For the most part, we don’t really care what the rest of the United States thinks. Heck, for the most part up here, we don’t care what each other think. 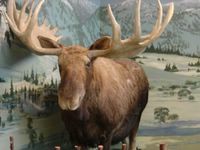 The reason we care what the rest of the United States thinks, however, is that we want to open up the Arctic National Wildlife Refuge (ANWR) for drilling of sweet, sweet oil. Some Alaskans are against this, but even they will admit that they’re in such a tiny minority that they could hold their meetings in a closet in Danny DeVito’s motorhome. Alaskans are overwhelmingly for drilling in ANWR. If we could drill in ANWR, we’d be there tomorrow. Literally. I’ve got a rig in my front yard, idling, ready to go and start drilling. So, to start drilling, I have to convince you that we’re not shameless, greedy beggars up here. The definition of pork is money not spent in your state. I can defend one of Alaska’s infamous two bridges, the Knik Arm Bridge, which would allow an easy commute to land for Anchorage to expand. Whenever I travel about the country I see big cities with huge bridges paid for by federal funds, and this would be another one of those. The Gravina Island bridge, well, not so much. I’d use that money for roads in the Interior of Alaska, to get to ANWR to get the oil out. I could easily put together a litany of pork projects from your state that your senator got rolled up into a defense spending bill, so I made up three of these five pork projects listed below, mainly because I’m lazy. But I could get real projects that would be just as silly. Why do we need to get the oil out? Alaska is a state filled with natural beauty (we inject very few of our mountains with collagen and silicon) and natural resources (sweet, sweet oil, shiny gold, zinc, tasty fishies, and, of course, trees, our woody friends). Our start as a state is similar to that of California or Colorado, except we don’t start with a ‘C’. We do, however, end with a vowel. When California and Colorado started out, it was mineral extraction that paved the way and created the infrastructure for the diversified and stable economy that followed. Alaska is attempting to follow this time-tested path (partially) by drilling for that oil in ANWR. Now, when I look at drilling in ANWR, I see that this endeavor will have an immense economic benefit to Alaskans and to the citizens of the United States as a whole. That oil will be used to allow people in Portland to drive to the mall. The oil will allow the United States to keep some of the piles of cash we’re shipping in boats over to Venezuela, and allow folks at the steel mill in Gary, Indiana to make steel pipe that we’ll use to connect up all the wells. To put it in as simple a way as I can: in ANWR we want to use 2000 acres. 2000 acres is 0.00009% of Federal land in Alaska. For these 2000 acres, we’ll create $140 billion dollars of economic value to society, without appreciable change to ANWR. Once the oil is pumped, the land will look the same as it did before, provided it hasn’t been covered in caribou carcasses created by stampeding concerned celebrities. People call those who would drill in ANWR greedy, but think about this one for a second: is it greedy to want to develop a resource for the benefit of millions of people? Or, is it greedier to not allow that development because of worst-case scenarios of doom and thereby deprive millions of people of those benefits? Speaking of benefits, there was also a report that came out talking about how much more money Alaskans got than they paid to the federal government, $1.89 for ever $1.00 of tax dollars we send in. What’s not mentioned is that $7 billion was spent in Alaska, while $184 billion was spent in California. I hate research, and normally employ the time-tested technique of “making crap up” but I thought in this case I should get my numbers right. You can find the basis of the tax information here. Duh. The federal government owns sixty percent (really!) of the largest state in the Union. Did you think that owning 222 million acres is cheap? Nope. You’ve got to replace the carpet if the tenants have dogs, you’ve got to wax the moose, and you’ve got to replace the roof. And that takes employees! If you want to cheapen up on Alaska’s cost to the United States, sell us some of that land. I’ve got my plot staked out already . . . ANWR. I’ll take it off your hands. Heck, I’ll pay you double the $0.025 cents per acre we originally paid for it . . .
We in California also want you to drill in the ANWR. And to help, we are ALL moving up to Alaska to share in the burden of all that sweet crude cash, just like we've done to the middle east. Think about it. How many Californians do you want as neighbors before your paradise is lost? Of course, California can return to its splendid beauty of pre-1849, the industrial revolution, and Tech boom once all of us move north. My condolences for your loss and pardon our greed. It knows no boundries. The answer is still no. And we like our Toenail Museum. By the way, what is that store named Curves in the picture? I want to visit now. Oh, yeah, there's that part. Actually, given climate (-50F) I think many would avoid Alaska period. But, if you all move in, bring cake. I'm in the mood for cake. Oh, and beer. Wow, you snuck in whilst I was typity-typing. See, I like California. At least Californians. I think some of the rules are a bit off, but that's why I'm in Alaska. Anyhow, Toenails aside, I think Curves was the result of a federal grant where one studies hyperbolas and parabolas and stuff. Or it could be a store that caters to chicks. Or maybe one that sells them . . . .
Can you go back and snap a few pictures inside the Curves store? A great way to expand your readership. I understand, but I worry that they'll buy something sharp and hurt themselves if we give them too much money . . . I looked Curves up and found out it was a gym for women. I just don't know if there's a market for scantily clad, toned, sweaty women on the Internet. We have a Curves here. I've never been brave enough to look in. Funny, I never see anyone coming in or out of one either. I'd like to put a bid in for the money you don't want to spend on Florida. The toenail museum had to be changed at the last minute to International because some Austrian and Massachusetts snips were found in the capital. Because of the sign change we had to ask congress for another 100 billion to accomidate the contractors change order. And I will send a check in the mail today for $10.00 for my portion of ANWR (at the rate of $.005 per acre I should get fit walking from my house to yours in the warm weather of course). I would like a nice vista that overlooks a smog filled valley with lots of auto plugged roadways to remind me of my short stint in the Golden State. Also the walk should be doable after a long night of drinking and pinochle at your house, so plan accordingly for me, and thanks in advance. It could be a Stepford place, where our mechanical wives go in for recharge while we sleep. Or just a gym. I think the only place you'd be able to get a view like that for $10.00 would be Bangladesh. There is a remote land purchase deal up here, though . . .